We are about halfway through the school year and it has been so full and rich! The children have all settled in; it is a joy to see how capable they are and independent in their environments. We do urge you to observe in your child’s classroom if you weren’t able to this fall - please contact Zitlali to schedule a Wednesday morning visit. I hope you are all reading your weekly Stepping Stones newsletters, as there are so many upcoming events to be aware of. I want to highlight just one here: the Cornerstone Montessori Elementary School board is engaged in strategic planning and wants your input. We are holding two focus groups for parents and guardians, at 9:30am on February 1 (immediately following the Cornerstone Cafe) and at 3:30pm on January 26 (immediately prior to Stone Soup). Your attendance at one would be most appreciated as we prepare for the school’s next plane of development. Childcare will be available for the January 26 focus group. Please RSVP for both dates to Zitlali. Every month, it seems, we learn of scientific research that demonstrates the benefits of a Montessori education. A study from 2014, summarized here in EdWeek, explains how unstructured time supports executive functioning. The freedom children have in our environments, to choose what work to do, where to do it, and whom to do it with, supports children’s ability to plan, make decisions, transition between tasks, and so much more. 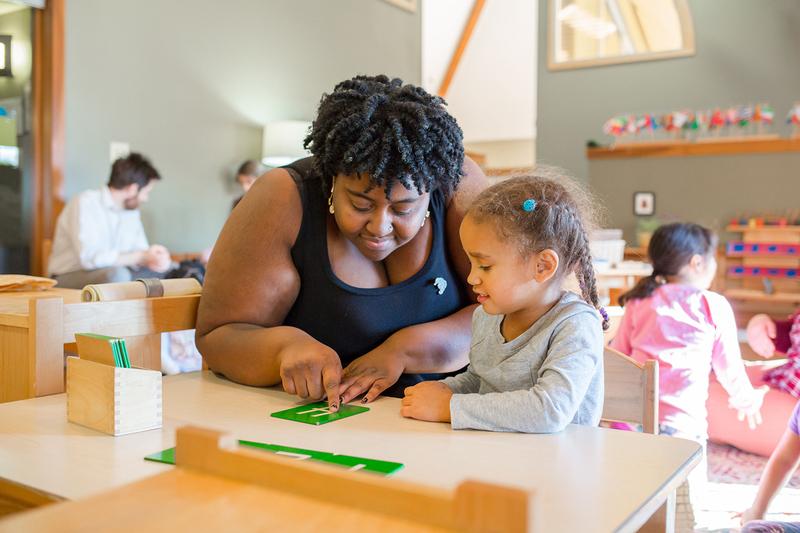 Montessori helps children build stronger brains, which we see every day here at Cornerstone. I hope that I will see each of you at one of our upcoming events - at Stone Soup, our special community events with Alicia Sojourner, or at a CMES board focus group. Language is an instrument of collective thoughts. Building community and the acquisition of language go hand in hand in the Toddler Community. The children under the age of two absorb the verbal and nonverbal communication in the room along with the older toddlers (2+ years), that are entering into the “why?” phase of their language development. Children that are not very verbal yet still have a strong receptive language. They work and play together, living in community, with an understanding of daily routines. There are specific language materials to present to the toddlers. The most important “material” both at school and home is human interaction. This is what gives language depth through the feelings that are attached to the communication. Through conversations, books being read, stories being told, songs being sung,and movement activities, the children’s vocabulary builds and their understanding of how concepts relate to each other. Other presentations in the room include naming objects, cards and actions. Some examples could include how to paint with water color, how to peel and slice a hard-boiled egg, how to put a puzzle together, set a table or how to put winter clothing on. Lessons in Grace and Courtesy are offered: “I would like some more milk please. Thank you.”, “I need some help.”, “I can help you.”, “This is my work.”, “Hi!”, “Good-bye. See you tomorrow!” Everyday each child comes with new information making a renewed community. Language comes alive in a myriad of ways in Children's House 1. Indeed, Maria Montessori herself referred to language as an instrument of collective thought. While the younger members of our community are focusing on developing their spoken language that will act as a building block for writing and reading, the elders of our community are discovering new ways to express themselves through language. In addition to standard English, many of the children in our community have been inspired to learn sign language, as a form of language and communication. In our philosophy 50% of a child's first year in the Children's House should be in spoken language. The children of Children's House 1 love to discover and create jokes, riddles, stories, and songs. Currently, a large group of children has begun its journey into cursive writing on paper. Not only is this a great skill for elementary and beyond, it opens the possibility for the children to put their wonderful imaginations onto paper through expression of Language. Language is everywhere in the Children's House, from Birthday celebrations to math presentations! Children have a unique capability to learn language during their first six years of life; language will never be absorbed so effortlessly after this sensitive period. In the Children’s House, we emphasize spoken language activities to give children lots of opportunities to build their vocabulary and socialize with other children. 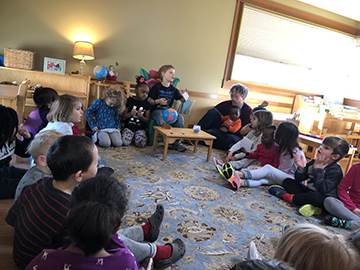 A few ways we encourage spoken language in the Children’s House are through card games, oral storytelling, and cultural folders (which spark conversation about ideas from around the world). Another important way we help children develop social language is through grace and courtesy lessons. Grace and courtesy lessons help show the child how to be in the world. The lessons give very clear and specific language around ordinary social interactions a child could experience every day. For example, how to greet an observer in the classroom, how to offer help, and how to let someone know they’ve hurt your feelings. Through these lessons, children are able to practice using the phrases before the moment they need them. Then, when a child finds themselves in a particular situation they are confident in themselves because they know what to say and how to handle the interaction. They’ve had the practice and built the foundation. As guides, we have to remember that our daily interactions with children and other adults in the room are unintentional grace and courtesy lessons. If I am consistent in how I offer help and respond to children, the children will in turn begin to mirror my language and my responses. One delightful way I’ve experienced children mirroring my behavior is in observing the way they support one another. Sometimes the smallest child presents herself as a seasoned parent in the way she comes to the aid of a friend. For example, one child helped stop the tears of another by saying: “Oh, I see you have a butterfly on your shirt. I like butterflies. Remember when we played butterfly bingo?”. I couldn’t have done it better myself. Happy New Year to all of our families! We have jumped right back into full swing in the Garden classroom and our environment is an exciting place to be, as always. This month we are sharing with you how language is approached in our environments. Language is a topic that is near and dear to my heart and I adore the opportunities that we have to explore and celebrate language in our classroom. Language in the Montessori environment is approached in a way that brings life to what may at times feel mundane. Learning about grammar, the rules of language, often seems a rather dull undertaking. Yet, the Montessori approach to language it is anything but dull. 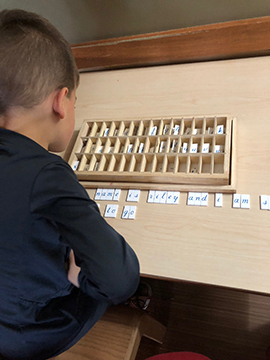 As the children learn about the parts of speech and how words work together to form sentences they are moving, searching, exploring, and experiencing language through the use of grammar boxes, command cards, and other materials. These materials guide the children in not only reading and writing the words, phrases, and sentences, but in performing, acting, creating, and being involved in the process. Ask an elementary child about grammar command cards and hear about the chance to throw an eraser, march with a pillow on her head, and crawl under a table! Of course grammar is only one aspect of language and we celebrate words and language in every area of our classroom. In every subject we are learning the etymology of words, exploring how language has a beautiful and rich history. We tell stories using language that tickles the ear and draws upon the curiosity of the child. We give precise and detailed language for scientific explorations, helping the child to perfect his studies. And we collect words building our vocabularies, knowing that have the right words at the right times helps us to express ourselves clearly when writing and speaking. Much of this work is subtle; it is in the books we choose to read aloud, the words we choose to utter, and the writing that is placed upon the shelves to be read. We know that these choices are important, after all language is powerful. We strive to equip the children with this power so that they can communicate and express themselves clearly no and in the future. 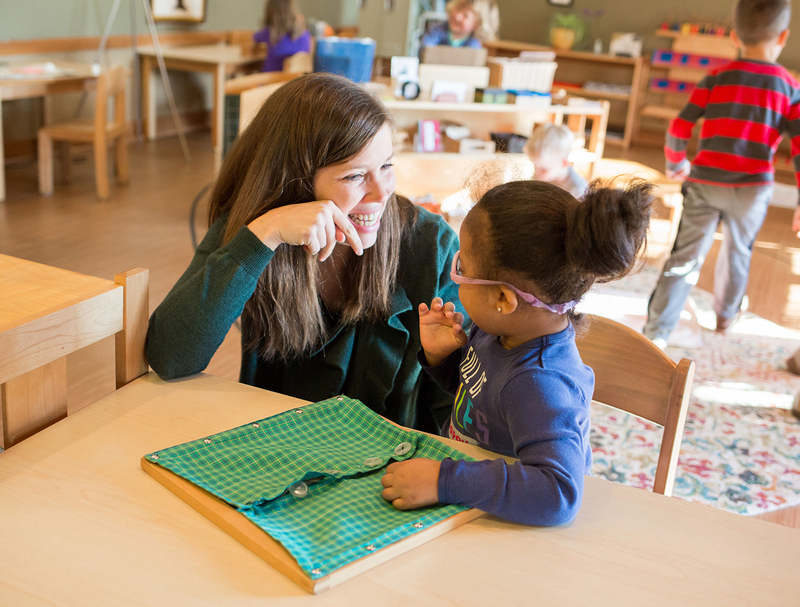 In the elementary Montessori classroom, language is taught with the children’s developmental characteristics in mind. We spark interest by activating their reasoning minds, we incorporate movement into their work, and we encourage collaboration between children. In the Pond classroom, children are exploring words. They are making lists of compound words and inventing their own, they are adding suffixes to the roots of words and seeing how this changes the function of the word, they are moving to learn about verbs, and collecting pictures of different kinds of nouns. Grammar and word study takes up a large part of our physical classroom, but it is only one part of the language curriculum. We also encourage children to have discussions, debates, or give oral presentations. Children also write and read everyday. They write stories, letters, plays, and research reports. During our individual conferences, we have been looking at and choosing just right practice reading books. And everyday we enjoy read aloud together. Our current read aloud book is Matilda, a request from a couple of children in the class and one of my personal favorites. In Upper Elementary, language continues to be very important as children move into accessing more text completely independently and writing proficiently. We focus on reading, writing, language, and speech in many different ways. We read in book clubs, for read-aloud, and independently. We write in many genres, completing the writing cycle with persuasive essays, fan fiction, movie reviews, personal narratives, short stories, poems, how to articles, and many others. We dive into spelling, word study, parts of speech and sentence analysis, grammar, and punctuation. 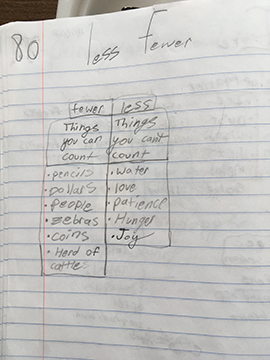 Concepts like abstract nouns, the apostrophe, homophones, and idioms are eagerly explored by upper elementary children who start to notice the specifics of language more and more. These pictures show two examples of language work that require careful attention to words. While we only occasionally give formal speeches, we think about how to present ideas clearly in conversation all day long – in planning, collaboration, problem-solving, and presenting and sharing finished work. There are always more ways to deepen our study and use of written and spoken language, and upper elementary minds have a wide variety of experiences with language. Mayflower Early Childhood Center is hosting a parent workshop called "Body Talk: Helping Children Develop Healthy Body Boundaries" on January 24th from 7 - 8:30pm. Tatum Bishop returns to us from the Family Tree Clinic to pass on some practical advice and important resources to parents as they help their children develop body awareness and sense of self. She will also of course help answer questions. The attached flyer has more information on this event.